More than five million Americans have diabetes but don't know it. As complications from diabetes can be serious, it's wise to know if you're at risk. 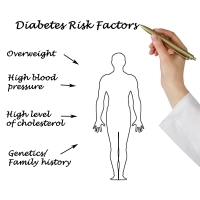 Take a look at the list below and see how many risk factors are true for you. If you answer "yes" to two or more of these questions, you are at risk and should talk to your healthcare provider about a blood test for diabetes. Is your waist larger than 35 inches (for a woman) or 40 inches (for a man)? Do you have a high triglyceride level? Do you have a low HDL cholesterol level and/or a high total cholesterol level? Do you have high blood pressure (greater than 140 over 90)? Have you had gestational diabetes (diabetes in pregnancy) or given birth to a baby weighing more than 9lbs?